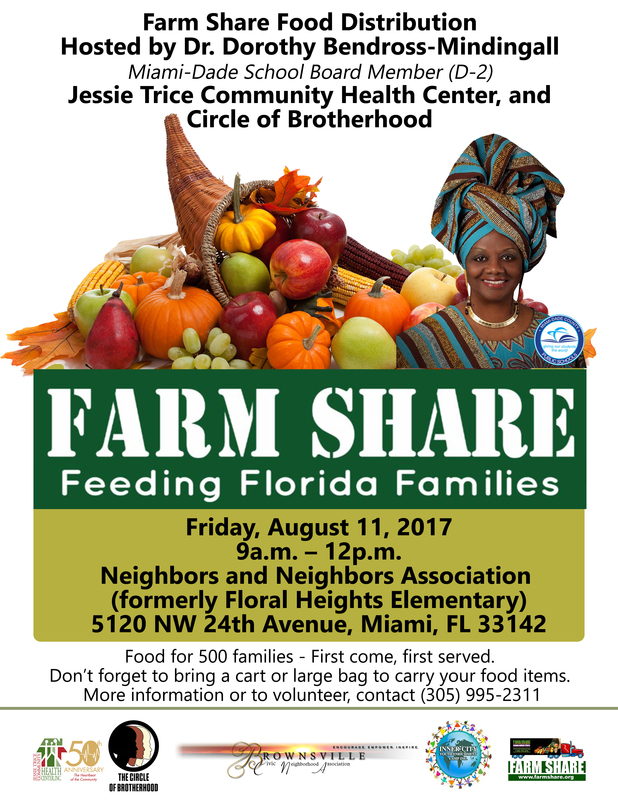 School Board Member Dr. Dorothy Bendross-Mindingall (D-2), along with Jessie Trice Community Health Center, Circle of Brotherhood, BCNA, and ICYEC will co-host a Farm Share Food Distribution to feed 500 residents on Friday, August 11, 2017, 9am – 12pm, at the Neighbors and Neighbors Association (formerly Floral Heights Elementary facility), 5120 NW 24th Avenue in Brownsville. Everyone is welcomed to attend and receive fresh food at this free community event. We suggest you bring a cart or a large bag to carry your items. Volunteers are also needed. Please call our office at (305) 995-2311 or email us at District2@dadeschools.net if you would like to volunteer.